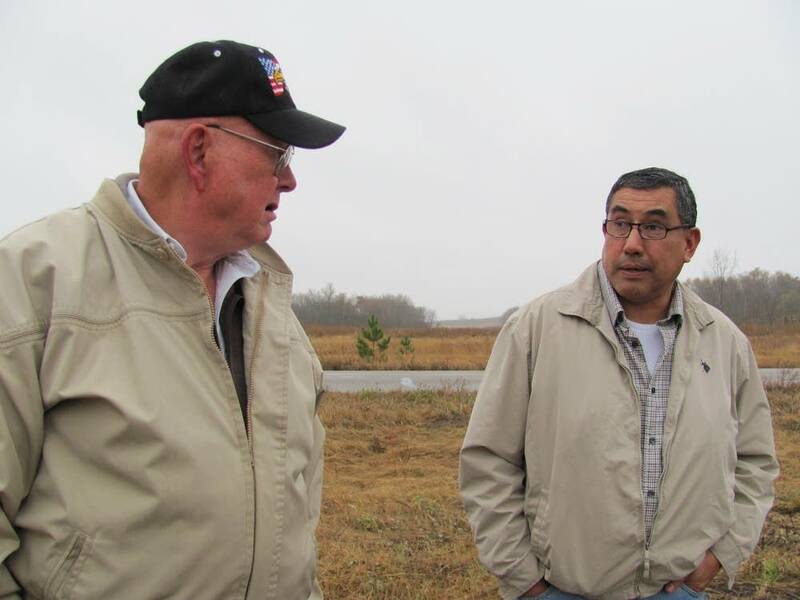 On a cold, rainy afternoon, Filiberto Abonce and Javier Garcia looked out at a large, weedy field on the outskirts of Long Prairie where next summer they hope to plant tomatillos, tomatoes, peppers and melons. It didn't look like much in an autumn rain, but the effort will be an expansion of a farming cooperative called Agua Gorda these men and a handful of others recently started here. Named after the city from which they hail in Michoacan, Mexico, the cooperative last summer sold thousands of pounds of produce grown in Long Prairie's in-city community garden, a garden established with the goal of bringing whites and Latinos together. Agua Gorda was an early success. "We wanted to start from the beginning and try to learn all the phases of agriculture, irrigation and weed control," said Abonce through a translator. Most of the cooperative members work regular jobs at local farms or meat processing facilities like Long Prairie Packing, so they tended the garden plots in the evenings and on weekends. They also each contributed $250 to the inaugural farming effort. "I'd like to do this full time," said Abonce. The population of Long Prairie, a city of 3,500 people northwest of the Twin Cities, is now almost one-third Latino, according to U.S. Census data. That's up from under 1 percent in 1990. Like many outstate communities in Minnesota, the city has had to adjust to an influx of new residents mostly drawn by food industry jobs. And as in other cities, Latinos and whites in Long Prairie have often lived parallel lives, existing side by side without much interaction. Downtown, there are several Latino-owned businesses, including a grocery store and a bakery. Some of the white-owned businesses have started hiring bilingual kids, to draw adult Latino customers. Lyle Danielson, Long Prairie economic development director. But there is also a bar on Central Avenue with a sign in the window that reads, "Stop the Invasion! Secure the border - no amnesty." The Agua Gorda Cooperative is an example of the city pushing through its differences to nurture a project that, in the end, could help Long Prairie as a whole. The endeavor thrived due to a lot of hard work by the co-op members. But it also benefitted from the expertise of two people who had never worked together, Lyle Danielson, Long Prairie's longstanding economic development director, and Jaime Villalaz, a business development specialist with the Minneapolis-based Latino Economic Development Center. Villalaz and the LEDC hosted a meeting late last year in Long Prairie to gauge interest in starting a cooperative among Latinos. The turnout was larger than expected, in part because Villalaz is a familiar figure. The Tijuana native works as a St. Cloud tax preparer and completes the returns of many local Latino families. "I started looking for business options for these people," he said. "I know they really work hard. There is all kinds of work they perform without complaining." Once the cooperative was formed, the LEDC guaranteed a $5,000 loan from the Northcountry Cooperative Development Fund and provided other assistance, such as connecting members with a farmer in Wisconsin, who advised them on growing crops in an unfamiliar terrain. But Agua Gorda still needed land, preferably with a source of water. And that's where Danielson came in. Villalaz and Danielson didn't know each other, but they both knew Tim King, who publishes a local bilingual newspaper called La Voz Libre. He introduced them, creating a connection that seems to have widening ripple effects in the community. 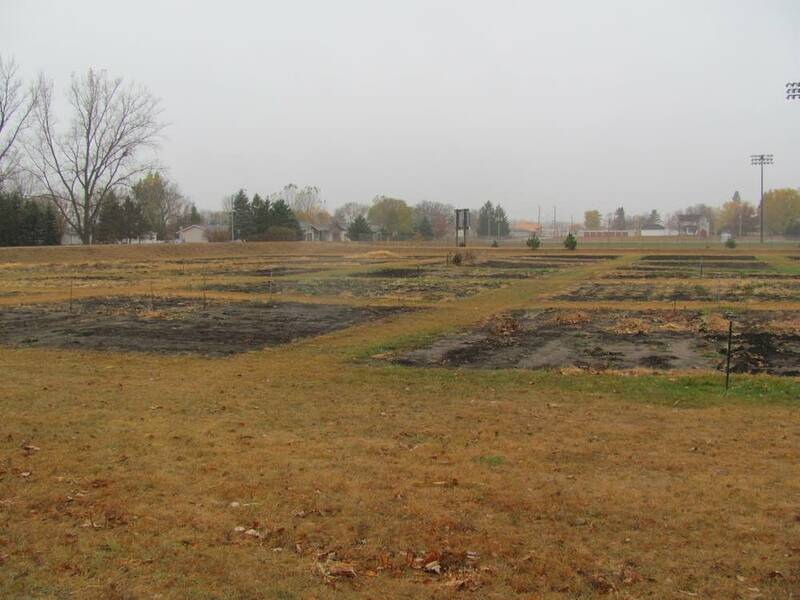 Danielson considered various land options and came up with the community garden, which he started three years ago on a large, underutilized patch of grass owned by the First Baptist Church, which he attends. With support from the city and groups like the Lions Club, his original goal was to "build community, not gardens." He thought the innocuous world of plants and fertilizer would be the perfect place for people from different cultures, who perhaps spoke different languages, to get to know each other. "I wouldn't walk across somebody's yard and look at their garden," he said. "But down there, I can walk over and ask, 'What the heck is this?'" When Villalaz and Agua Gorda came knocking, Danielson saw the opportunity to further his goal of connecting Long Prairie's cultures. He expanded the garden to accommodate the Latino growers and rented the land at a discount. He even personally paid part of the cost to run a water line. "We started with 40 some plots and now we have 108," Danielson said. "I would say a fourth of the gardeners are Hispanic people." At first, he said, some of the homeowners near the gardens said they didn't want Latinos there. "They thought the worst. But their prejudices have been dashed. They have come back and apologized." It hasn't been all smooth going. Some white gardeners complained about empty beer cans around the garden plots last summer, implicating the Latino growers. And the Agua Gorda members said some of their produce was stolen and a hose was damaged, perhaps on purpose. Danielson thinks the damage was accidental, that the hose was likely run over by a riding lawnmower. "You have to get along," Danielson said. It's a delicate dance. Long Prairie Mayor Don Rasmussen thinks people in his city are growing used to each other. "I really believe we have made a lot of progress in that area," he said. "It seems to be that more people are knowing their neighbors. Everybody seems to be accepting. I shouldn't say everybody. We have a few. There still are people howling about this, that and the next thing. But they would do that no matter what happened." He said housing isn't segregated in Long Prairie. And when he goes to City Hall, Latino businesspeople say hello, something that wouldn't have happened a few years back. "We just had our football homecoming," said Rasmussen, who has been mayor for six terms. "The kids who were up for candidates, out of the five young men up for homecoming king, two were Hispanic. The kids don't give a darn. They don't see color unless it's hammered into them by their parents." Members of the Agua Gorda Cooperative described Long Prairie as peaceful, free of the violence some of them experienced in Mexico, and a good place to raise kids. "It's welcoming here," said Garcia. His brother, Jose Garcia, a coop member who also runs a shop downtown, said he tries to adapt and be polite. "It's pretty good. It's not perfect." Making Latinos feel welcome has practical benefits, Danielson said. He instigated a "shadowing" program, where high school students can learn from people working professional jobs, such as at the hospital. The hope is young people will stick around, especially as the older white population continues to age. Yet, Danielson doesn't speak Spanish and was limited in what he could do to foster Latino economic development. "I don't understand the language," he said. "They are family oriented. They are not quick to go to a meeting. They don't get involved. That is a barrier." The obstacles were diminished somewhat after he met Villalaz. "Jaime is the bridge," Danielson said. "Now, when I meet some of these Hispanic people, they know who I am. They know I work with Jaime and that helps." Villalaz said his connection with Danielson works in the other direction as well. "(Lyle) has been a great resource, not only for me, but for the Latino community," he said. "I didn't have too many expectations about getting that piece of land (in the community garden). I thought it was too small. But it's just the first step to create something." If everything falls into place, including funding, Agua Gorda will be farming the larger plot of land at the edge of Long Prairie next summer. The field sits on the backside of the city's mostly empty industrial park and business incubator. "If they want it to happen, I think I can make it happen," said Danielson, noting that the city council would have to sign off. The effort could even stretch beyond Long Prairie. Villalaz and John Flory, special projects director with the LEDC, are working with others to establish a network of Latino restaurants, butcher shops and stores in the Twin Cities that would buy more Minnesota-grown and processed meat and produce. That produce could include Agua Gorda's expanded harvest. The LEDC is also conducting a study that could lead to the purchase of a butcher shop in Long Prairie that's been empty for years. "We have started to do a feasibility study to see if we might buy it," said Flory. "A group of Latino butchers and restaurant owners in the Twin Cities would buy it and start it up." The goal, he said, is to employ local Latinos and help them own their own businesses. "We think Latino restaurants and supermarkets would like to buy from Latino growers in Minnesota that own their own businesses rather than being the stoop labor," said Flory. A stronger Latino business class can only be good for Long Prairie, said Danielson. "They are here to stay." Jennifer Vogel is a freelance journalist living in Minneapolis.